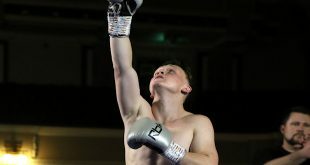 Last night, at the Kings Hall, Stoke-on-Trent, Carl Greaves Promotions in association with Impact Boxing – hosted a show featuring six contests. 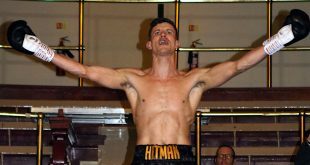 The main bout saw Jamal Le Doux of Hanley lose out to Adam Jones of Denaby Main 57-58 in a six round light-heavyweight contest. 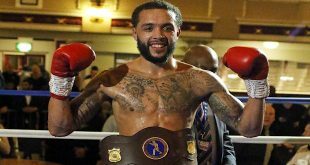 The first couple of rounds looked fairly even and both men were matching punch for punch but there was a smear of blood on Jamal’s nose in the third round and he appeared a bit ‘flat’ in the fourth. Burslem’s Kaash Buttery was quick-footed as usual, also scoring a 40-36 victory over his opponent Naheem Chaudhry of Blackburn. 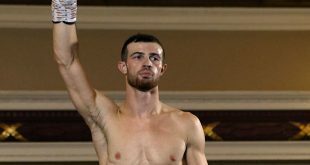 Nottinghamshire’s Ben Eland won his four round welterweight contest 39-37 over Lee Hallett of London. There was huge support for Debutant Wesley Leavy who was keen to impress on this his first outing. The Stoke man kept busy throughout and used a variety of shots to get the point’s win 40-36 over opponent Darren Snow of Dinnington. But the most action was seen in the contest between local man Rob Fletcher of Stoke and Kieran Pitman of Burbage. Just seconds in to the opening round and ‘Fletch’ sustains a nasty cut just above the left eyelid. Referee Kev Parker gestures to the elbow and fighting continues. In the third round Pitman is put on the canvas three times and is stopped. His left eye (above lid) had sustained a cut before the stoppage.